Agile Software Development is well established as an effective way to produce software quickly and effectively, but medical device software developers have concerns about the suitability of Agile. As a pioneer in the application of Agile to medical device software, I can address those concerns to help organizations find the advantages of Agile while maintaining high-quality software and compliant development processes. 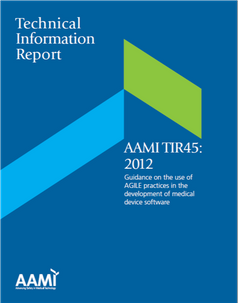 As one of the lead authors for "AAMI TIR45 Guidance on the use of AGILE practices in the development of medical device software" and lead instructor for the associated AAMI Course (link to AAMI site), I provide industry-specific guidance on the safe and effective use of Agile. For medical device development organizations motivated to improve their quality management system, Agile Quality Systems can help. Whether the motivation comes from issues identified by regulators, or an internally identified need to improve, I work with the development team to identify opportunities and provide specific solutions to be implemented within the organization’s time, budget, and capacity constraints. For new medical device developers needing to establish a quality management system, I provide a comprehensive and simple set of procedures and templates for software, hardware, and systems development, focusing on compliance to ISO 13485, FDA 21CFR820.30, and IEC 62304. As an experienced creator and user of product development processes, I focus on practical procedures that fit with the organization's context and the product's risk level. Audits and Assessments provide information to management about the organization's level of performance, and identifies risks related to regulatory certifications, regulatory submissions, or regulatory inspections. This information can be used to identify corrections and remediation activities that are needed before engaging with regulatory agencies. It can also be used as input to Quality System Improvement activities described above. As an experienced and certified auditor (American Society of Quality (ASQ) Certified Quality Auditor) specializing in ISO 13485, IEC 62304, ISO 14971, and FDA 21CFR820, I can lead or join a team to audit many elements of a Quality Management System, including Design Controls, CAPA, Risk Management, Complaint Handling, and others. As an experienced product developer and auditee, I know how to avoid trivial observations and focus on providing audit results that help organizations improve their processes and their compliance to regulations. Decades of medical device experience is too much to summarize here. Contact us for more information on how Agile Quality Systems can help your organization.